Documentaries, no matter how compelling, are often like vegetables on your dinner plate. Though usually educational and informative, and like those greens, full of ingredients that are good for you and beneficial to absorb, they’re not likely to nearly compare to the enjoyment of followup dessert. Which makes a features film like The Reflecting Pool, a nuts and bolts documentary dressed up in all the engrossing finery of a thriller, an inventive and captivating idea. Writer/director Jarek Kupsc, a Polish immigrant to the US, stars in The Reflecting Pool as Alex, a New York City based journalist born in the Soviet Union, who feels he made a wise choice to live here instead, where he can enjoy a career in a free press. That is, until the editor at his magazine (Lisa Black) informs him that there’s a hostile corporate takeover in the works and their days are numbered, but she wants to go out in a blaze of glory with a hot story. That opportunity arrives with a mysterious videotape offering evidence that 9/11 may have been a government conspiracy rather than a foreign attack, and his editor insists that he go for it. The sender turns out to be Peter (Joseph Culp), a man who lost his young daughter in one of the planes that hit the Twin Towers. And Peter’s life is consumed, for reasons yet to be revealed, with discovering an alternative truth about what really happened on 9/11. Alex, who is more of a careerist than an avid muckraker, accepts the assignment with an initial lack of enthusiasm. But he is soon as obsessed with following unconventional leads as Peter. 9/11, a tragedy, failure of response, coincidence, conspiracy, coverup, or insurance fraud? All these potential scenarios run rampant in The Reflecting Pool, as frantic talking heads alternately mouth off as well as roll. Prokop takes a chance as a filmmaker in combining all the mountains of information of a documentary with the suspense and passion of a feature film, and he mostly pulls it off. There are rough spots where the characters seem just about to cave in under the weight of all the details they’re delivering to the audience in the guise of dialogue. And Alex’s own back story is a little sketchy when not naive, as a supposed prominent and learned journalist whose grasp of the past, whether of the Soviet Union or the US, appears to have been gleaned from history for dummies. 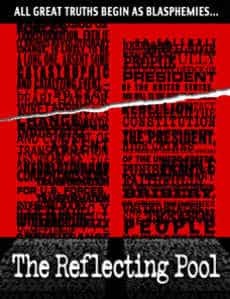 But The Reflecting Pool ultimately sheds a provocative light on the events of 9/11, that challenges rather than dictates to the audience, and with much to ponder in the way of more questions than answers. Okay, now that you’ve had dessert, go eat your vegetables.